Remember how, back during Amanda's guest post on "Dueling Darcys" I mentioned that you might want to keep your eyes peeled (which is a disgusting turn of phrase, really) for some upcoming goodies? 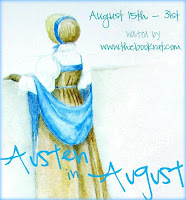 AND THEN, remember how a giveaway popped up for Dear Mr Darcy (aka the younger of the dueling Ds), and you thought that was what I was talking about? Fifteen years after the end of Pride and Prejudice, Elizabeth and Darcy are living their happy ever after, splitting their time between Pemberley and their London home and raising their six lively children. A surprise visit from Colonel Fitzwilliam's brother, Edward, fires Elizabeth with a desire for travel, as Edward has been infected with the Regency craze for Egyptology. Their Egyptian adventure sees a romance for Edward as well as buried treasure, a lost tomb and the mystery of the desert. But at the heart of the novel is the enduring love of Lizzy and Darcy as they raise their children and face the challenges and delights their continuing life together brings. 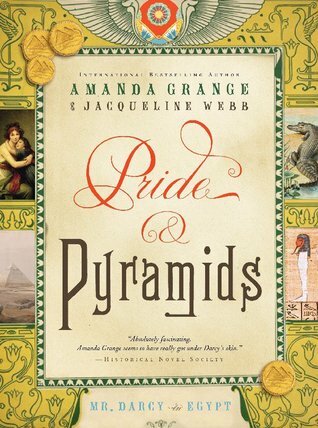 Thanks to the awesome people at Sourcebooks*, I have a copy of Pride and Pyramids to give away to one lucky reader! *You heard about how they were awesome already, remember? One reader will receive a copy of Pride and Pyramids by Amanda Grange! Yay! I would love to read this! I've heard a lot of good things about it. Thanks for the chance to win a copy! Congrats to Amanda on the new title! I think the extension to the Egypt craze will be pretty believable! Egypt is such a fun setting. Thanks for the giveaway. I have always been fascinated by Egypt and the pyramids. What better thing than to include them in a retelling of P&P. Can’t wait to read this one! This sounds like a great, inventive retelling! I am amazed by how many spinoff ideas people have come up with for P&P. Egypt seems to be trending these days. Not that Amanda is jumping on a bandwagon, of course. Only that I think it's a great development. I love ancient civilizations and the more they show up in modern books the happier I am. Thanks! Duh! Of course I want this book so so much! Most definitely disgusting! I've kept "my eyes peeled" anyway and am excited for the chance to win this book! I can't wait to read this one, thank you & Misty for the cool giveaway! *sigh* I live in the UK.. love the cover and the title though! I've been waiting to read this, there is a copy on order at my library, but a giveaway copy for myself would be wonderful. Thank you for the giveaway! THis one sounds weirdly interesting. I teach Ancient History to 8th Graders... mixing P&P with Egypt sounds fun! This has everything I could possibly want in a book - Darcy, Elizabeth, and Egypt. I need it! Their Egyptian adventure sounds exciting!